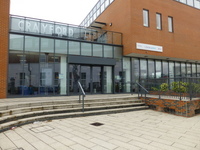 This venue is situated in Crayford. The venue is in a pedestrian area. The nearest mainline station is Crayford. 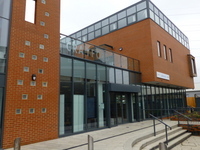 Many library users park in the adjoining Sainsbury's car park or across Crayford Road in Tower Retail Park. 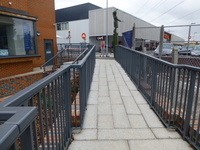 The photograph shows the sloping path and steps from Sainsbury's car park, which are an alternative to the ramp. The door opening is 166cm (5ft 5in) wide. 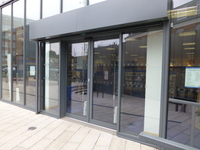 The automatic sliding doors operate by movement sensor. The clear opening width between the security detectors inside the entrance is 109cm. You are on Level Change (Main Entrance - from Crayford Road). Skip to the next section. The ramp or slope is located to the right of the storage shed, after the old Town Hall building. The step(s) is / are deep. 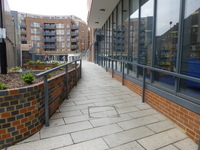 The ramp and steps described are from the pavement alongside the old Town Hall building up to the library and community centre. 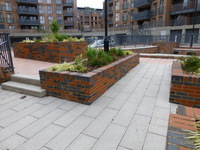 From the access driveway, there is also a vehicle access ramp (picture 4) which could be used as an alternative step-free route. You are on Level Change (Main Entrance - from Sainsbury's Car Park). Skip to the next section. 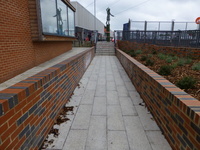 The ramp/slope is located leading down from the car park to the side of the library building. The width of the ramp/slope is 135cm (4ft 5in). The step(s) is/are located leading down from the car park. 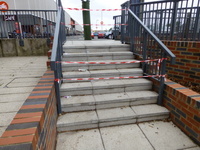 After the first ramp and steps there is a moderate ramp up to the main entrance. The ramps overcome all the steps. 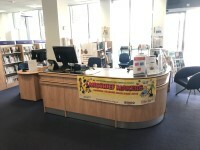 The desk/counter is 4m (4yd 1ft) from the main entrance. The desk/counter is high (110cm+). The desk/counter has a low (76cm or lower) section. There is a touch screen. 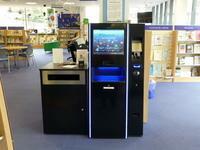 The touch screen is at a suitable height for a wheelchair user. You are on Post Office. Skip to the next section. 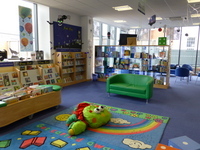 There is a post office located within this library. 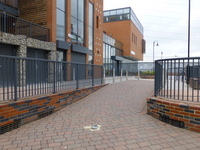 There is level access to the post office. 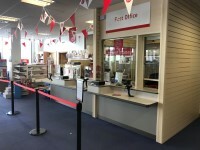 The post office is 7m from the main entrance. 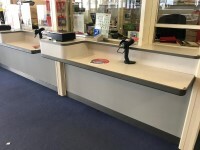 There are fixed hearing loops within the post office. The counter is 76cm high. There is ample room to sign documents. The post offices opening times are the same as the library. 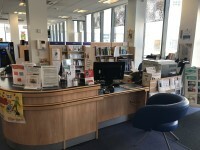 Facilities in the building include a meeting room for hire, IT suite, public computers, copying and printing facilities, self-service check in desks, a contact telephone point for Council services. 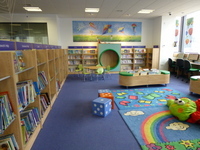 There is a children's library area. 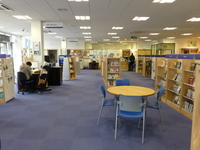 Free WiFi is available throughout the library. Throughout the library there is lounge-style seating and tables with dining-style chairs. You are on Library. Skip to the next section. This library does not have a regular supply of books in Braille. This library does have a regular supply of books in large print. This library does have a regular supply of books on tape or disc. There is an ordering service. The library does have computers with accessible software. 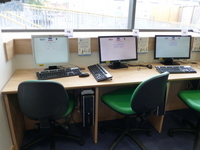 Auxiliary aids are available for computer users. A large text keyboard and large rollerball mouse is / are available. Equipment available for people with a visual impairment includes whole page magnifiers. 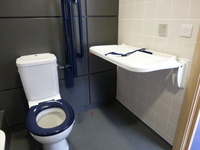 This accessible toilet is approximately 5m (5yd 1ft) from the main entrance. This accessible toilet is located to the left after you enter. 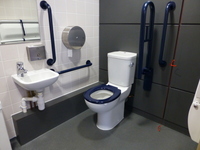 The width of the accessible toilet door is 92cm (3ft). 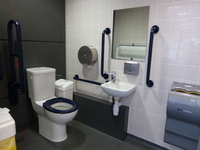 The dimensions of the accessible toilet are 153cm x 220cm (5ft x 7ft 3in). Wall-mounted grab rails are available for the toilet. There is a shelf within the accessible toilet. The shelf is not higher than 95cm (3ft 1in). The unisex toilets are located on the left of the entrance area. 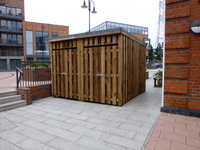 Unisex toilets are 5m (16ft 5in) from the main entrance. Baby change facilities are located in both toilets. 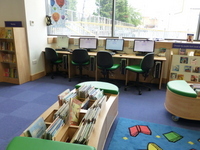 The library does operate a centralised home library service. Please contact the Council for more details. 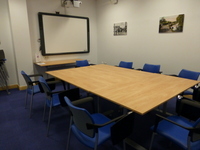 The photograph shows the meeting room which is available for hire.